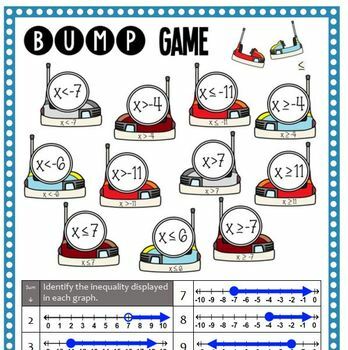 Students love to play bump games in Math, and once they play one bump game, they will catch on very quickly. 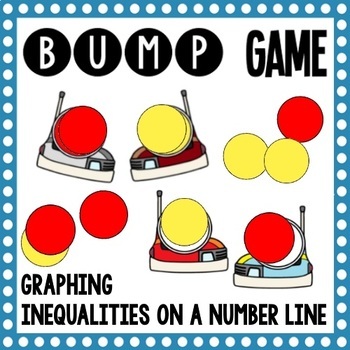 Bump games get your students engaged and participating in "math talk". Instructions are included. All students need is a pair of dice, some round counters or other small game pieces, and a copy of the game board. All you have to do is print a game board and provide students with game pieces! 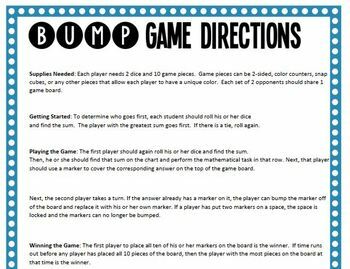 Playing the Game: The first player should again roll his or her dice and find the sum. Then, he or she should find that sum on the chart and perform the mathematical task in that row. Next, that player should use a marker to cover the corresponding answer on the top of the game board. Next, the second player takes a turn. If the answer already has a marker on it, the player can bump the marker off of the board and replace it with his or her own marker. If a player has put two markers on a space, the space is locked and the markers can no longer be bumped. Winning the Game: The first player to place all ten of his or her markers on the board is the winner. If time runs out before any player has placed all 10 pieces of the board, then the player with the most pieces on the board at that time is the winner. For more fun with this same topic, check out the Intro to Equations and Inequalities Bundle!